A muzzle brake is an important aftermarket accessory which has grown into popularity in recent years. 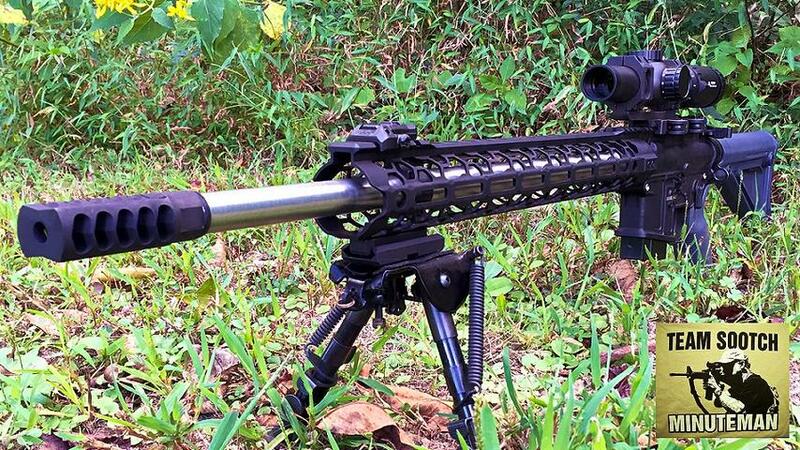 Cornered just to precision shooters in the past, muzzle brakes have now found their use even with varmint hunters. The 6.5 Grendel is more of a long-range, precision shooting cartridge, and does require some upgrade to function flawlessly and up to your expectations. Here, we’ll learn about the benefits of using/upgrading your 6.5 Grendel rifle’s muzzle brake, as well as the features which make one ideal. We have also reviewed a handpicked list of the best 6.5 Grendel muzzle brakes on the market, to further help you decide if a muzzle brake is for you and which one to choose. If you’ve been shooting the Grendel for quite a while, you must be familiar with its accuracy, low recoil, and capability to hit targets over a long range (1000+ yards). But if you’re not, just know that the 6.5 Grendel is a mid-point between the 5.56 and 7.62 calibers. The 6.5 Grendel is usually and mostly used for long range precision shooting. It’s what the cartridge was designed for. One very big hurdle is the recoil. The 6.5 Grendel has some extra weight and recoil compared to the 5.56 (due to its size), but also a better ballistic coefficient. This means the round has a flat trajectory over long distances. Reducing the recoil of the rifle, will no doubt add to the accuracy. That’s where the muzzle brake kicks in. The purpose of the muzzle brake is to reduce the felt recoil of a rifle. Muzzle brakes are known to reduce recoil by almost 50 percent, which will mean a substantial reduction with long-range precision shooting calibers like 6.5 Grendel. The reduced recoil also helps with the quick realignment of sights after every shot, since the barrel deviates less. This is advantageous for hunting at mid to long ranges. Note: Please check your local state laws to understand the permitted length of a rifle. A muzzle brake will extend your rifle’s length by a couple of inches. Quality: The very first feature to look for in a good 6.5 Grendel Muzzle Brake is quality. Or in any product for that matter. A good brake must be made from strong, lightweight, durable material which should be able to stand the test of time, gas impingement, and natural factors. Proper Vent Placement: A good muzzle brake must have vents aligned in a proper direction so the gasses escape properly without interfering with the recoil or function of the rifle. A vent should not be present on the bottom of the brake, as it will create an upward force when you shoot from a prone position. Recoil Reduction: A good muzzle brake must actually reduce the recoil of your 6.5 Grendel-based rifle, not only on paper but in reality. Your brake must require little or no tuning for muzzle climb reduction, and should be easy to tune if needed. Doesn’t Require Gunsmithing: An exceptional muzzle brake should be a plug-n-play device which is easy to install, and doesn’t require a visit to the gunsmith. Fortunately, all the brakes mentioned in this review can be installed with minimum effort. Most do not contain shims or any extra material. Easy to Maintain: A muzzle brake will collect grime and dirt, just like the barrel does. Hence, it should be easy to clean and preferably rustproof, so you can easily wash it. Affordable: Finally, a good muzzle brake doesn’t have to cost you an arm and a leg. There are brakes costing more than a couple hundred dollars, without the fee of a gunsmith. But keeping that in mind, our top picks won’t burn a hole through your wallet. Now we're going to switch gears and see which muzzle brakes made out list and why. We'll be covering the ins and outs of each model. The Area 419 Hellfire Muzzle Brake tops our chart for the best 6.5 Grendel Muzzle Brakes. The brake has been manufactured from stainless steel and is available in a chrome and black nitride finish. 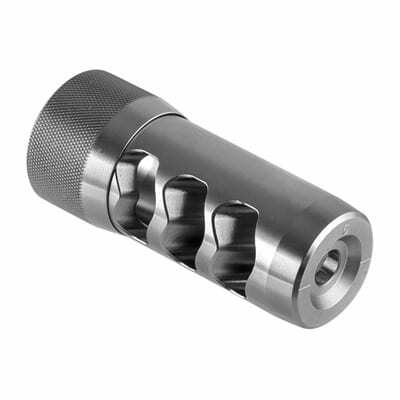 To install it, simply torque the universal adapter onto your barrel with a 5/8″ wrench. Plus, it also features a simple, round knurled nut that requires no tools to time the brake. Moreover, the brake will not turn as you as you torque the collar to lock. In simple terms, you won’t need to visit a gunsmith and pay extra money to get it bored or installed. The rearward facing vents offer an exemplary reduction in recoil up to a staggering 52%. Additionally, it also controls muzzle rise without the need for top porting. The muzzle brake is easy to maintain, and you can simply soak it in a carbon cleaner to remove the grime. The brake is sturdy enough to be cleaned with steel wool without damaging its surface. The Hellfire Muzzle brake is an exceptional aftermarket accessory to use with the 6.5 Grendel caliber. It is strong, durable, easy to install, and can be easily mounted to different barrels. Looking at the price point and versatility, this is no doubt the best bet for you. 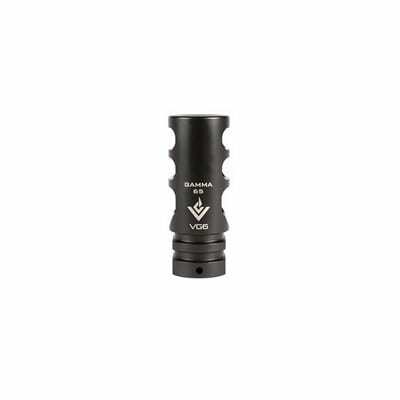 The Gamma 65 Muzzle Brake from VG6 Precision is a muzzle brake and compensator hybrid. It has been CNC machined from high-grade stainless steel and is crafted with extreme precision. 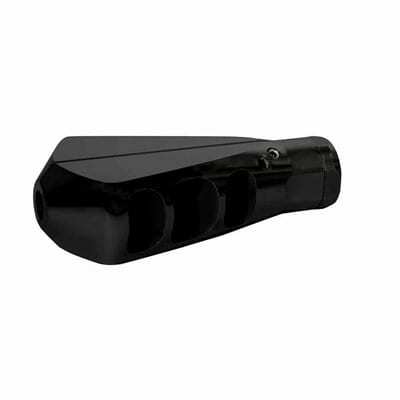 It features a black nitride finish and can be mounted on barrels with 5/8-24 RH TPI threading. The brake is quite versatile and can be used with 6.5 Creedmoor, 6.5 Grendel, and 6.8 Remington SPC cartridges. The combination of braking and compensating features allows the shooter to take consecutive follow-up shots with minimal adjustment. The vents of the muzzle brake have been meticulously designed and properly aligned to virtually eliminate the recoil. If your barrel has the proper threading, you can install the muzzle brake in probably less than a minute. The package also includes a crush washer so alignment is not a problem. 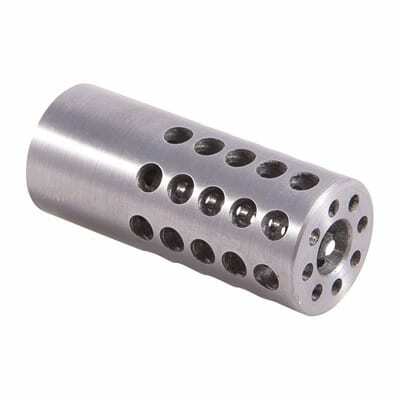 The Gamma 65 is a muzzle brake and compensator hybrid and reduces recoil to such an extent that you won’t mind it. The brake is aesthetically pleasing and is perfect for use when hunting and long range precision shooting. The Viper Brake from Lancer Systems is a tunable muzzle brake designed to reduce the felt recoil and muzzle jump from your 6.5mm rounds. The brake features a conical blast chamber design, to let the gasses expand properly. The chamber is complemented with four adjustable jets over the top, which direct these expanding gasses upwards, thus preventing muzzle jump. Additionally, angled blast baffles are incorporated to reduce recoil and further stabilize the rifle. The package includes a jam nut and six tuning jets to let you adjust the recoil according to your needs. It is available in black-nitride and stainless-steel finishes and looks awesome when mounted on a barrel. This muzzle brake is extremely helpful for precision shooters who need to adjust their rifle depending upon the situation. The Viper Brake is an exceptional muzzle brake for bench rest and precision shooters. The recoil and muzzle jump can be tuned to meet your requirements. However, the brake sends a tremendous blast wave, so you may have to re-zero your scope over long distances. The Epsilon 65 combines the function of a muzzle brake, compensator, and flash hider into one. The precision-cut design of this brake features a three-stage chamber to reduce recoil, and the three prong design reduces muzzle flash. The brake is easy to install on barrels with proper threading, plus it also features a pre-drilled pinhole for permanent attachment on 14.5 barrels needing 16.1". It has been properly machined to cut proper markings and reduce the overall weight to only 2.7oz. Apart from the side vents, six valve holes on the underside of the Epsilon 65 further balance gas flow to promote comfortable shooting. The brake is available in a black nitride or stainless steel finish, so you can choose the one which suits your rifle best. The package also includes a crush washer for easy installation and alignment. Compatible with 6.5 Creedmoor, 6.5 Grendel, 6.8 Remington SPC, and similar calibers. The Epsilon is a combination of a muzzle brake, a compensator, and a flash hider. The brake drastically reduces the recoil and is good for hunting, precision shooting, and tactical uses. Considering its price, the Epsilon offers excellent value for money. 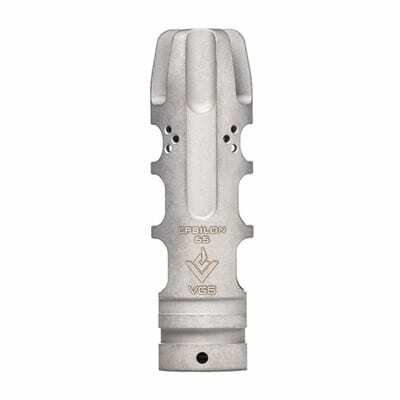 The Vais muzzle brake features a simplistic design with an array of gas dispersing holes around its perimeter, limiting muzzle rise with no increase in muzzle blast. Plus, multiple gas expansion chambers disperse and redirect gases for effective recoil control, while limiting blast effects. The holes are both horizontal and perpendicular to the center line to disperse gas and sound properly. The brake is available in a chrome-moly steel finish or a stainless steel finish. The Vais micro-brake drastically reduces the recoil of your rifle and has been explicitly designed to be used with small and mid-sized barrels. A muzzle brake helps with reducing the felt recoil, and hence the overall accuracy of your rifle. A good muzzle brake for 6.5 Grendel should be of good quality, have proper vent placement, and be easy to install and clean. The 6.5 Grendel is a long-range shooting cartridge with a lesser recoil and is apt for precision shooting. Using a muzzle brake reduces the recoil further to let you shoot accurately.